MEYLE complementary parts cater for virtually any repair need. Just a tiny part – but what a difference! Though less in the focus, the small parts in and on the vehicle are equally important for getting you safely and comfortably from A to B. Just like any wear-and-tear part they need to be replaced once in a while. The MEYLE complementary product range features a wide range of these parts. Here, you can find anything from wiper blades to window lifters and gas springs. 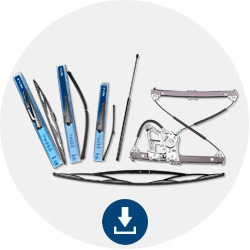 Wear-and-tear parts from A to Z.
about the complementary product range as download files. Find all information on MEYLE products, installation tips and a lot more on these pages. Find all MEYLE spare parts for passenger cars, vans and trucks in the online catalogue.